In honor of National Suicide Prevention Awareness Month, BWA is proud to announce the launch of our latest project "Friend Yourself" in collaboration with Santa Clara County Behavioral Health Services to encourage young adults living in Santa Clara County to seek mental health services to address issues with depression which are made worse with substance abuse. The digital campaign focuses on reaching young adults in Santa Clara County through ads in movie theaters, through Pandora, Facebook, and Instagram over the next few months. 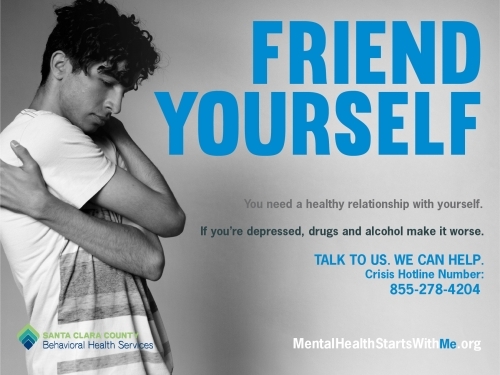 All of the ads direct audiences to the county's Crisis Hotline and to the campaign's website, mentalhealthstartswithme.org which includes information and resources for mental health services throughout the county.